Third up for examination, but first to be raced this weekend is Ironman Sweden, taking place in Kalmar on Saturday. This is the second year of the event so there is a limited set of results to work with. 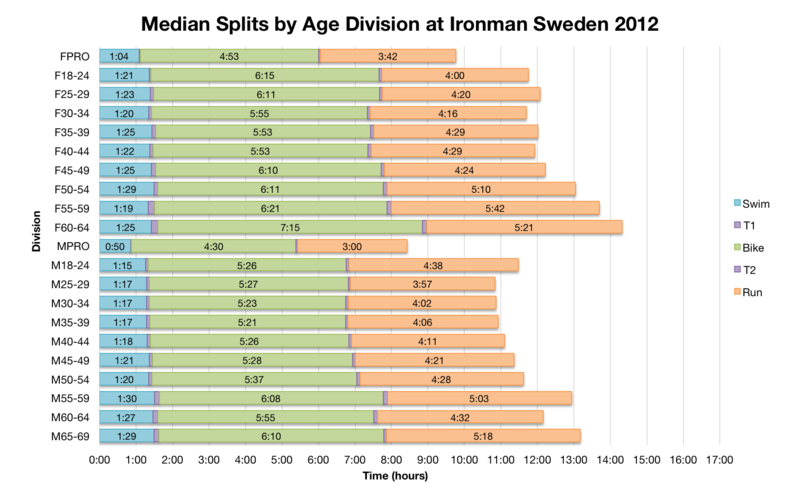 What one year of data makes quite clear though is that Ironman Sweden can be very fast with a contingent of strong sub-9 performances in the age group ranks. 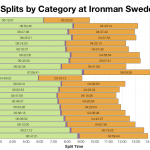 We’ll have a better idea whether 2012 was an outlier or if Ironman Sweden is the place to go to set personal bests after the weekend. 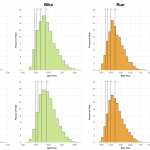 As with Ironman Copenhagen yesterday Kalmar leans towards the faster end of the racing spectrum; splits are generally skewed to the left, particularly for bike and run. 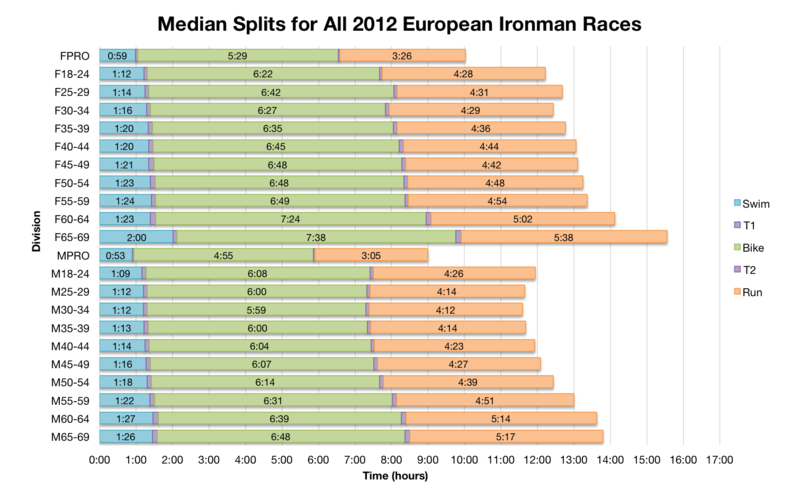 Comparing with the distributions from all 2012 European Ironman races Sweden fills out the leading edge. 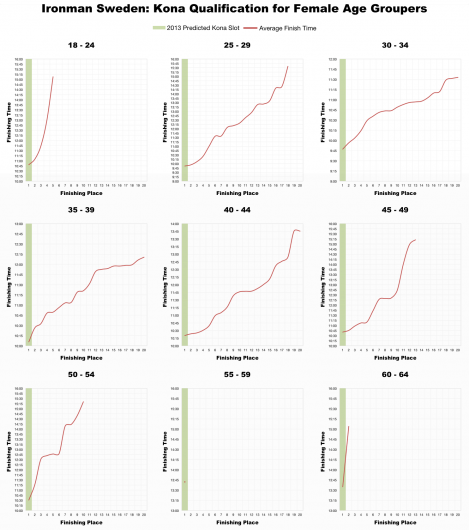 These are the charts we expect from a fast race. 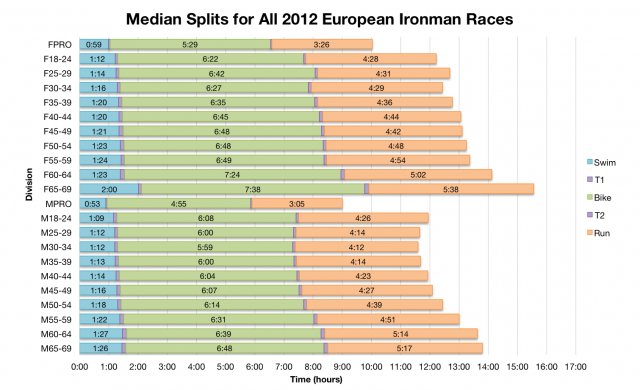 Inevitably the median splits follow a similar trend and again in comparison with the European wide medians times are typically faster. 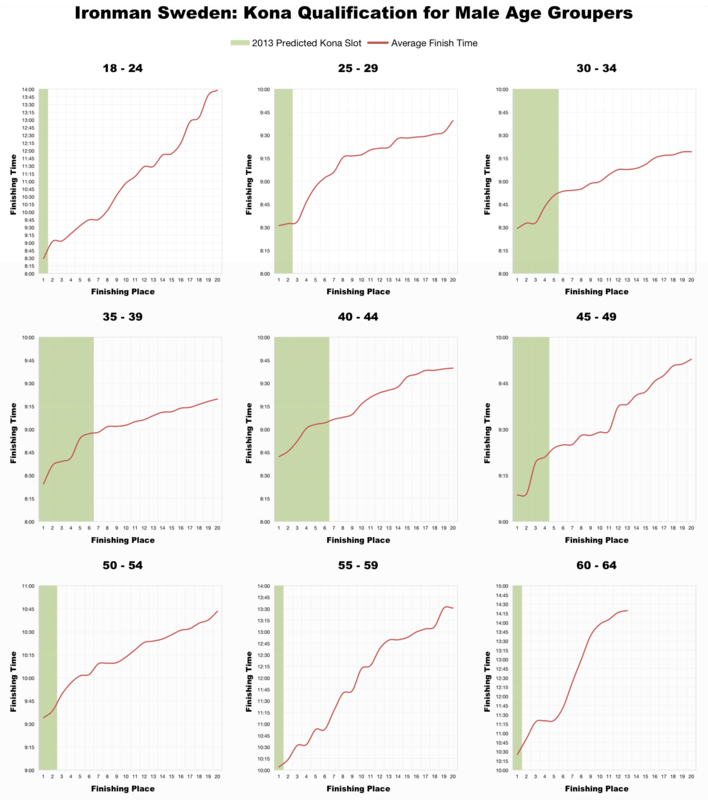 It is worth noting that the swim on average is a little slower and the pro women’s run appears to buck the trend too. 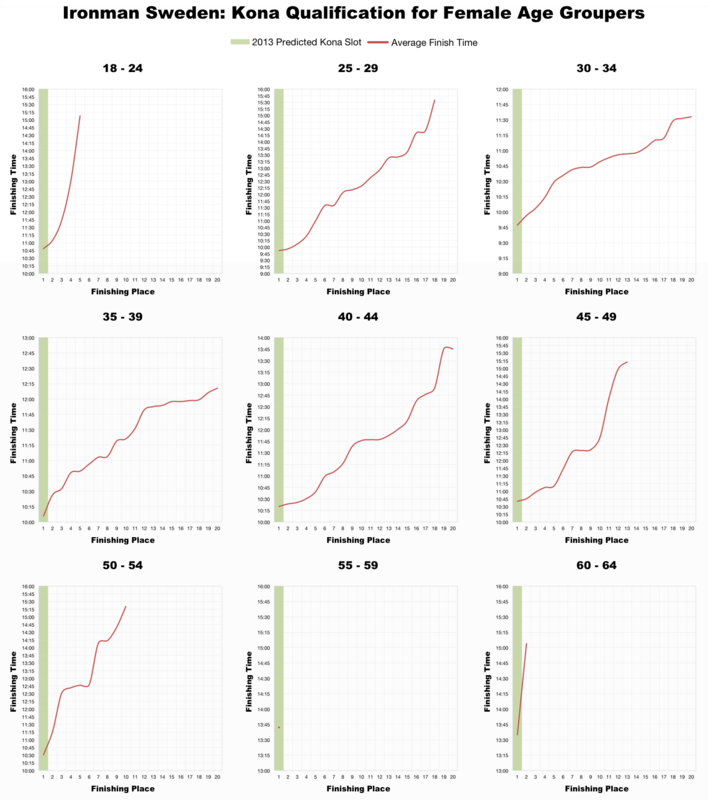 The overall pattern is of a faster race though. So it makes sense to compare with Ironman Frankfurt. 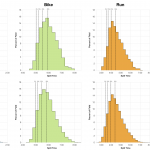 Here the swim times are clearly slower, but the bike times are generally faster and the run times similar. While Sweden saw a few phenomenal age group results the course appears largely comparable with the likes of Frankfurt. Once again provisional Kona slot allocations are available on the Ironman Sweden website saving me from making predictions (European races seem much better at announcing the allocations in advance). 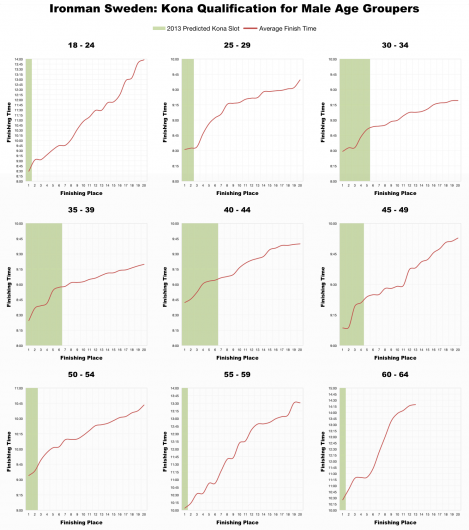 There are no surprises here – few slots in the small women’s field and more for men between 35 and 45. Qualifying times are fast. Some of that will be the course and conditions, but for men under the age of 45 you really need to be breaking 9 hours. I’ve not seen many races where that has widely been the requirement for qualification. Last year Sweden saw 26 age groupers dip under 9 hours (on average 6 age groupers per year break 9 hours in Frankfurt), that’s a pretty strong field. For those trying to qualify in Sweden only 4 of those 26 have returned this year: two in the professional ranks, one in M35-39 and one in M40-44. Perhaps times won’t be quite as quick this time round. As usual a woman will need to win her age group to qualify and this may take a sub-10 hour or low 10 hour effort. I’m confident of another fast race from Sweden this year – the course appears to be well suited to it. Whether it proves to be quite as fast as last year is another matter – 2012 may well have been the perfect combination of course, conditions and athletes. Even so those looking for a qualifying slot should be prepared to race fast.